Sintered-metal self-lubricating bearings are based on powder-metallurgy technology. They are economical, suitable for high production rates and can be manufactured to precision tolerances. Sintered-metal self-lubricating bearings "are widely used in home appliances, small motors, machine tools, aircraft and automotive accessories, business machines, instruments, and farm and construction equipment. Most porous-metal bearings consist of either bronze or iron which has interconnecting pores. These voids take up 10% to 35% of the total volume. In operation, lubricating oil is stored in these voids and feeds through the interconnected pores to the bearing surface. Any oil which is forced from the loaded zone of the bearing is reabsorbed by capillary action. Since these bearings can operate for long periods of time without additional supply of lubricant, they can be used in inaccessible or inconvenient places where relubrication would be difficult. Many variations are possible to meet specific requirements. From 1% to 3.5% graphite is frequently added to enhance self-lubricating properties. High porosity with a maximum amount of lubricating oil is used for high-speed light-load applications, such as fractional-horsepower motor bearings. A low-oil-content low-porosity material with a high graphite content is more satisfactory for oscillating and reciprocating motions where it is hard to build up an oil film. more pronounced effect on the apparent density and flow rate. After sintering, the bearing, the bearing must be sized to the specified dimensions. Sizing reduces interconnected porosity and produces greater strength, lower ductility and a smooth finish. Bronze: The most common porous bearing material. It contains 90% copper and 10% tin. These bearings are wear resistant, ductile, conformable, and corrosion resistant. Their lubricity, imbeddability, and low cost give them a wide range of applications from home appliances to farm machinery. Leaded Bronzes: Have a 20% reduction of the tin content of the usual 90-10 bronze and 4% reduction in copper. Lead content is 14% to 16% of total composition and results in a lower coefficient of friction and good resistance to galling in case the lubricant supply is interrupted. These alloys also have higher conformability than 90-10 bronzes. Copper-Iron: The inclusion of iron in the composition boosts compressive strength although the speed limit drops accordingly. These materials are useful in applications involving shock and heavy loads, and should be used with hardened shafts. Hardenable Copper-Iron: The addition of 1-1/2% free carbon to copper-iron materials allows them to be heat treated to a particle hardness of Rockwell C65. 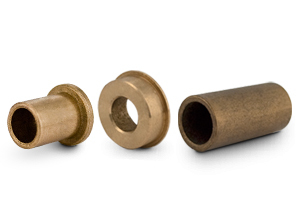 They provide high impact resistance and should be used with hardened-and-ground shafts. Iron: Combine low cost with good bearing qualities, widely used in automotive applications, toys, farm equipment, and machine tools. Powdered-iron is frequently blended with up to 10% copper for improved strength. These materials have a relatively low limiting value of PV (on the V side), but have high oil-volume capacity because of high porosity. They have good resistance to wear, but should be used with hardened-and-ground steel shafts. Leaded-Iron: Provide improved speed capability, but are still low-cost bearing materials. Aluminum: In some applications they provide cooler operation, greater tolerance for misalignment, lower weight, and longer oil life than porous bronze or iron. The limiting PV value is 50,000, the same as for porous bronze and porous iron." The load-carrying capacity of porous-metal bearings can be measured by a friction / wear criterion, which is a measure of the heat generated by the bearing. It is called the PV factor. 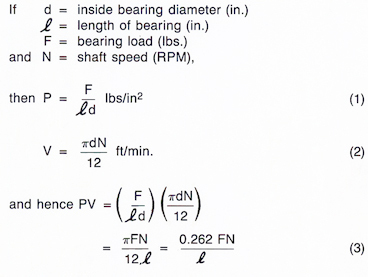 The PV factor, as its name implies, is the product of the bearing load, P, expressed in pounds per square inch of projected bearing area, and the surface velocity of the shaft expressed in feet per minute. 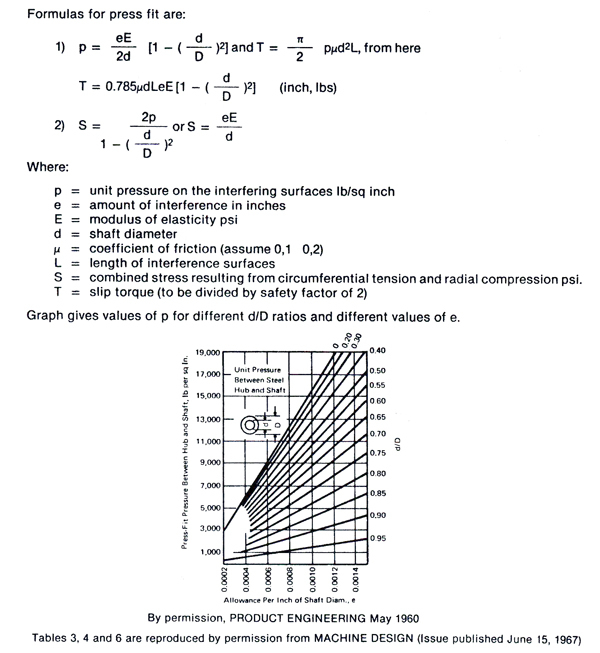 Most engineering data relating to the PV factor lists an upper limit, of the factor, i.e. a value which should not be exceeded for satisfactory bearing operation. The working value of the PV factor, however, is often less than this upper limit, for example if the sliding velocity is not sufficiently high to maintain an adequate lubricating film. In addition, the PV limit is affected by the static load-carrying capacity of the material, which should not be exceeded. The latter is a function of environmental factors, bearing clearances and geometry and the nature of the load (continuous, intermittent or shock loading). Detailed information on these considerations is usually furnished by the metal manufacturer. General guidelines are summarized in Table 1. As in all bearings, satisfactory operation of porous-metal bearings require suitable clearances between shaft and housing. 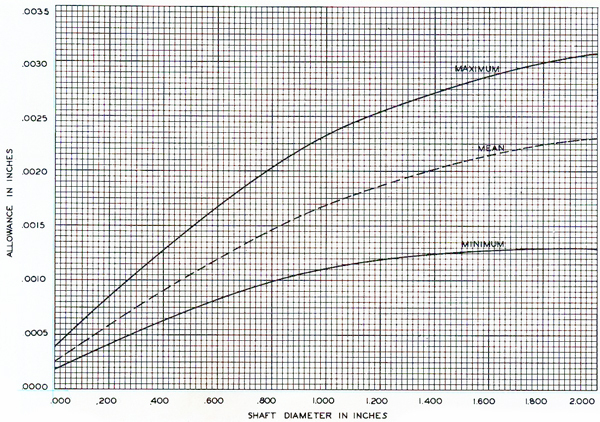 While guidelines depend on the materials used and the nature of the application, a representative chart showing recommended bearing clearances for porous-bronze and porous-iron bearings is given in Figure 1. Limiting conditions for operation of porous bearings can be expressed as a PV factor. Since P = load, psi; and V = surface velocity, fpm; the PV value gives an index of frictional heat generated on a unit area of the bearing surface. A maximum value of 50,000 is common for porous bearings. For long-time running with no additional lubrication, 20,000 should be a limit in selecting loads for various speeds. For thrust bearings, a maximum PV of 10,000 should be used. Provision to replenish the oil supply is desirable when the PV factor approaches the maximum under continuous operation for extended periods of time, or for high temperatures. For such cases, oil can be applied to the OD or ends of the bearing. From there it is drawn, by capillary action, into the bearing and metered to the shaft. A reservoir of grease next to the bearing also can be helpful. Under certain conditions these recommended values can be exceeded but with a sacrifice in service life. The upper curve (maximum) and all allowances above the mean are suggested for iron-based bearings only. The chart is representative of average conditions and each application needs to be evaluated individually. ''Keystone Porous Bronze and Porous Iron Bearings", Fig B-34, p.9. A press fit is used when available space and torque to be transmitted is limited. Tolerances of mating parts have to be closely controlled to assure a minimum and avoid all excessive interference. Proper running clearance for bearings depends to a great extent on the particular item. 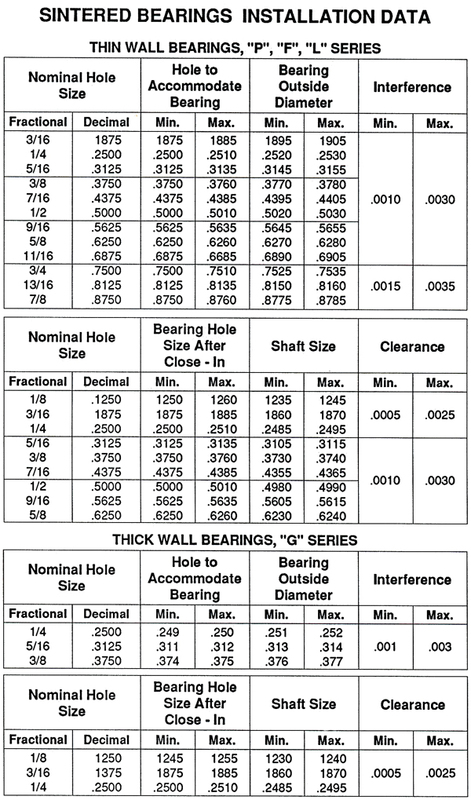 Only minimum recommended clearances for oil impregnated bearing used with ground steel shafting are listed. Plain cylindrical journal bearings are commonly installed by press fitting the bearing into a housing with an insertion arbor. For housings rigid enough to withstand the press fit without appreciable distortion and for bearings with thickness approximately one-eighth of the bearing outside diameter, the press fits shown are recommended. Oil impregnated sintered bearings are manufactured under strictly controlled conditions, and are subjected to in-process inspection. They are tested for radial crushing strength of magnitude. b) to maintain surface finish of I.D. Above values are reasonable for the following conditions: continuous rotation, oil impregnation without additional lubrication. Porous-metal bearings are used widely in instruments and general machinery, in which their self-lubricating characteristics and load-carrying ability is very desirable. When properly designed, they can be both economical and highly functional. Their manufacturing method consists of briquetting the metal powder mixtures to the proper density. Subsequently, they are sintered for different duration subject to the temperatures. Sintered bearings are then sized to obtain the required dimensional characteristics. This is followed by inspection and impregnation with a lubricating oil.